Onboard credit is fundamentally free money given to you to spend onboard your cruise, on pretty much anything you want (although this can vary by cruise line). It's a given that we all love free money, so below we’ve highlighted some ways to help you spend it! Most of us love a drink on holiday, but naturally get worried about keeping the costs down. A cruise is the perfect opportunity to test your taste buds, and whether you enjoy a tipple or not, there is always something for everyone onboard. From unique cocktails and mocktails, to beer, wine, and exotic fruit juices, there will definitely be something to entice you and quench your thirst. Some cruise lines also feature some delicious smoothie bars where you can try all kinds of creative variations. 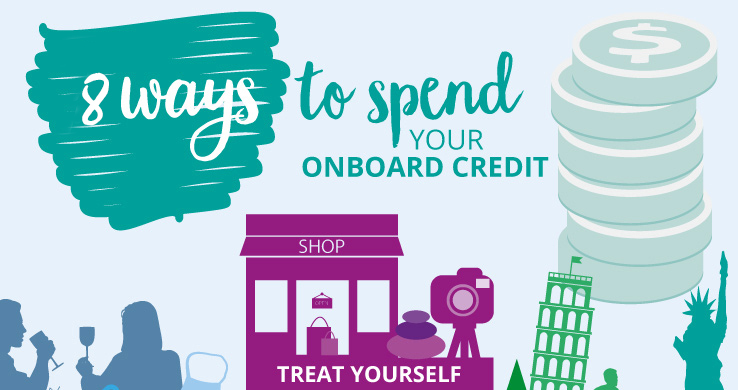 Why not use your onboard credit to purchase a drinks package, and instead of having to worry about the cost of every single drink you can just sit back and enjoy as many as you want. Speciality dining has become a signature feature in the cruising world, and is great for special occasions or simply treating yourself. Options can range from the imaginative Alice in Wonderland themed restaurants onboard Royal Caribbean, to Celebrity’s delightful Italian steakhouse Tuscan Grille. These speciality restaurants often come with a cover charge, and seeing as it isn’t every day that we can afford to head out to a speciality restaurant, using your onboard credit to sample something new is a very helpful option. Onboard credit is applicable to most purchases, and now with a range of shops onboard it's just like heading out with a gift card. From designer handbags and watches, the latest gadgets, clothing, or souvenirs, there is always something that you ‘just have to have’ - whether for yourself or a loved one back at home. Just to give you an idea, you can find Michael Kors onboard with Celebrity Cruises, Ted Baker with P&O Cruises, and Swarovski in the jewellery boutiques onboard Princess. We all want to relax on holiday, and indulge in a little bit of me-time. This is something that not everyone can afford in every day life, but onboard credit opens up a sumptuous new world. Cruise lines offer some of the best spas in the world, with award-winning treatments and luxurious brands. With everything from manicures, haircuts, hot shaves, massages, and weight loss treatments, the extensive menus mean you are sure to find something to help you feel your very best. Some of our favourite spas onboard are Norwegian Cruise Line's Mandara Spa®, Princess Cruises' Lotus Spa, Celebrity Cruises' Canyon Ranch Spa, and Marella Cruises' Champneys. We now live in a day and age where we love to share all of our memories through photos. Because of the price of professional photographers though, we more often than not indulge in DIY photoshoots! The professional photographers onboard snap every smile and every moment, and the formal night portraits are particularly special. As soon as you catch sight of your photos, you're sure to want each and every one of them, so why not use your onboard credit to purchase your favourites? With fantastic itineraries taking you to some of the most exotic and fascinating places in the world, using your onboard credit for a shore excursion can allow you to take advantage of a fantastic opportunity. Make the most of your trip, and delve deeper into each port of call without having to dig too deep into your pockets. With so many activities and amazing facilities available onboard, this is a fantastic way to spend your onboard credit. Although almost all activities onboard are complimentary, there are a few which have a small charge, such as cookery lessons or private FlowRider® lessons. Your onboard credit can provide you with the required funds to take advantage of these facilities, and learn or try something new. Stay in contact with your loved ones by spending your onboard credit on internet usage. Some cruise lines provide internet at a price per minute rate, or others offer various packages which are suitable for different needs - depending on how often you would like to be online. Connection speeds and WiFi availability can vary depending on ship and region, so it's worth finding out more about this before investing in a package.